Applications are open for the 2019 Community Fellowship program. Apply now! Code for America's Community Fellowship program pairs local Brigade talent with government to improve services for vulnerable people they serve. Building on the best of the original Code for America Fellowship, the Community Fellowship program aims to strengthen the relationship between local Code for America Network leaders and their governments — to create conditions where change can “stick” and help transform government from the inside out. Code for America fellows will spend 6 months collaborating with government staff, researching user needs, meeting with key stakeholders, and improving service delivery to vulnerable populations. The product could be an early-stage application, an improved procurement, an open data release, or other project that improves the delivery of a government service or function, at a fraction of the cost typical in government. The process will act as a vehicle for driving cultural and structural change inside of government — encouraging innovation, reducing risk by involving users early, and increasing capacity for serving the public. Work on the most complex challenges of our time. Use your skills to make a huge impact on people’s lives. Connections. The biggest names in the tech industry and the civic technology movement will provide you with unparalleled networking, mentorship, and support. Professional development. You will develop lasting relationships and learn new skills in a creative and fast-paced atmosphere. Exercise creativity. Working in small teams with your government partners, you’ll conduct user research to decide what you build and how you build it. A labor of love. You’ll not only accomplish a lot and make the world a better place, but you’ll have a lot of fun working with other passionate people. 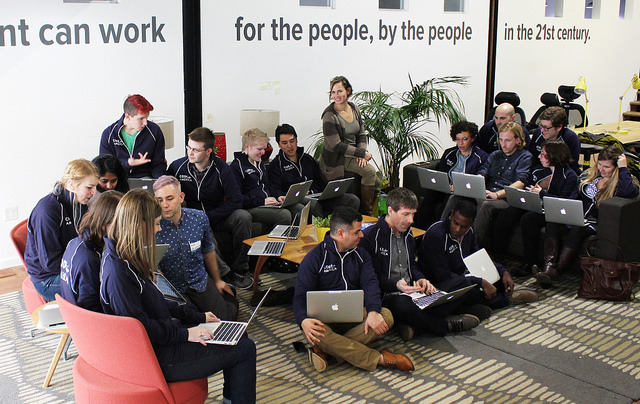 Who Are Code for America Fellows? Experienced, mid-career professionals from your community who are invested in strengthening local services and government with long-term, sustained relationships and have been part of your local Brigade. What does a Successful Fellow Look Like? Fellows will all be members of their local brigade, but they will come from a variety of backgrounds in technology, and in life. Some may come from large companies or startup environments, while others have experience working in government or social impact organizations. Highly collaborative. Fellows are able to actively engage with their teammates as an equal partner, motivator, and teacher. They openly and directly provide and ask for feedback, and they want to work with their governments as partners. Comfortable wearing many hats. In small teams, it’s vital to the success of team that teammates are able to jump in and out of roles and tasks to push their product forward. They are scrappy, resourceful, and creative problem solvers. Adaptable. There is no real “typical day” as fellow. While teams often define some sprint planning and decisions making processes, routines change often. Able to work independently. Fellows are self-motivated and ask for help when they need it. What Makes for a Good Government Partner?